The DeMello Off-Road rear FJ bumper is designed with high clearance and strength in mind. The rear bumper is formed from 3/16in 5052 Aluminum with a 1/4in thick mounting plates and 1in thick recovery points, to ensure it's strength against heavy trail use. This bumper comes powder coated with a texture finish powder coating. 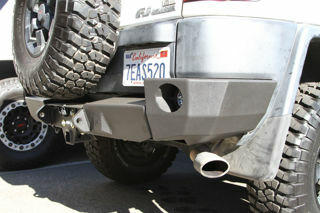 The 3 piece design makes fitting the bumper up to the FJ a perfect fit every time. You can use your factory back up sensors in this bumper (modifications necessary) and add additional back up lights to the outer wings to help assist you with back up at night. The flat top of the bumper in the center and outer edges gives you a extra place to stand when getting to your roof rack or simple good flat surface to rest on with the back door open. Notes: This rear bumper requires cutting your factory plastic bumper and modifications to use your factory back up sensors. This rear bumper does not work with your factory hitch, we do sell a hitch that works with our bumper but it is not government licence for towing. 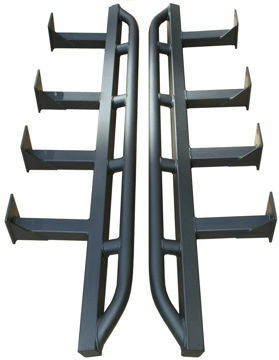 When ordering the hitch, note that the hitch is steel. 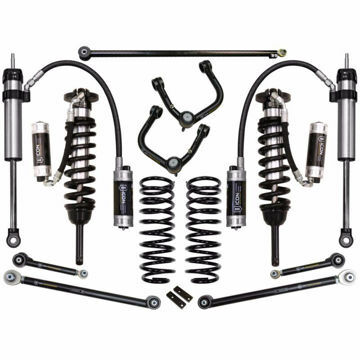 The Stage 7 suspension system w/ tubular UCA for the 2007-2009 Toyota FJ Cruiser is the best over all handling bolt on suspension system you can install, and incorporates all of the top level components along with adding the CDCV adjustable shocks.